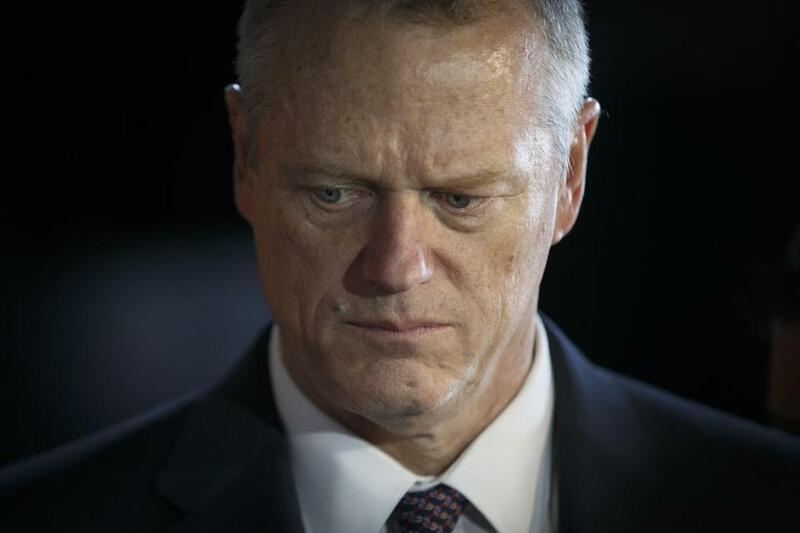 A national bond-rating agency has downgraded its measure of Massachusetts’ creditworthiness for the first time in almost 30 years, a decision that has the potential to tarnish Governor Charlie Baker’s image as a good steward of the state’s finances. Despite Massachusetts’ solid growth, S&P Global Ratings said Friday it is lowering the state’s rating one notch, to the third-highest tier, AA, because Beacon Hill leaders have failed to replenish the state’s rainy day fund as promised. “Despite above-national average economic growth through a prolonged period of economic expansion, the state has not demonstrated a commitment to its adopted budget reserve policies,” the rating agency wrote. The news may not affect how much it will cost for the state to borrow money, Treasury officials say. The two other top bond-rating agencies affirmed the state’s second-from-highest rating last week, and Massachusetts remains in better fiscal shape than many states. Baker has repeatedly proposed and signed budgets that divert money meant for the emergency savings account. State representatives and senators in the Democratic-controlled Legislature have the final say over how funds are appropriated and have agreed to those budgetary tactics. S&P warned the state in 2015 about its dwindling rainy day fund, putting Massachusetts on notice that its bond rating could be knocked down. But Baker and state lawmakers did not aggressively attempt to rebuild the savings account in the time since. Instead they diverted money meant for it into the operating budget. Revenue from capital gains taxes — levies on investment profits — over a certain threshold are supposed be socked away in the savings account under state law. But Beacon Hill leaders have instead used that money to pay for the costs of everyday government. Diverting money from the rainy day fund is, “a problem because there is volatility in [tax] revenues and the idea is: in periods of strong economic growth, you should prepare yourself for a downturn,” said John A. Sugden, S&P’s primary credit analyst for Massachusetts. The rainy day fund is supposed to be a bulwark against extreme cuts to state services when tax revenue falters. But to paper over state budget gaps, policy makers — including Baker and his predecessor, Democrat Deval Patrick — took billions meant for the fund in recent years, even during relatively good economic times with tax revenue increasing. That money was, of course, spent on state services that otherwise would not have been funded. But it means the cash reserves won’t be there when the economy inevitably turns south. That’s extremely dangerous, fiscal watchdogs say. In the summer of 2007, just months before the Great Recession began, the state’s rainy day fund had a little more than $2.3 billion. Now, with economists warning a new economic downturn could be coming, the fund is at $1.3 billion. While the rainy day balance declined by about a third in the final years of Patrick’s tenure, it has rebounded modestly under Baker, going up about 15 percent since he took office in January, 2015, according to data from the state comptroller. Patrick, who led the state for eight years, including during the Great Recession, saw bond rating increases during his watch. The last time one of the big three bond-rating firms — S&P, Moody’s Investors Service, and Fitch — downgraded Massachusetts’ credit rating was March 1990, according to the office of Treasurer Deborah B. Goldberg, which oversees bond sales. In an interview, Baker underscored that the state’s bond rating with Moody’s and Fitch remains the second-from-highest, and that he does not expect the S&P rating change to hurt the state’s ability to borrow money, nor increase how much it will cost. “People will continue to enthusiastically purchase our bonds,” he said. He said, however, the downgrade by S&P “is not remotely comparable to what happened in 1990.” Then the state was on a much more wobbly financial footing and had much worse bond ratings. On Friday, S&P emphasized the state’s many fiscal strengths including “swift action” from policy makers when a budget gap emerges. But, Baker, sitting in his ceremonial office that dates to 1798, acknowledged “it’s a wake-up call” to regularly put more cash away in the fund. He said he hoped the Legislature would adopt some version of a proposal he made in January to set aside some money for the savings account before each fiscal year begins. A spokesman for Senate President Stanley C. Rosenberg declined to comment. House Speaker Robert A. DeLeo said his chamber has prioritized paying down the state’s big pension obligations, while also making deposits into the rainy day fund. “We believe Standard & Poor’s decision overlooks the significant importance of balancing these two responsibilities,” he said. In recent days, two of the Democrats running for governor, Mayor Setti Warren of Newton and Jay Gonzalez, a former state budget chief, have knocked Baker over the budget.